If you found the perfect match for your company, you shouldn’t have to worry about whether that candidate fits your budget. 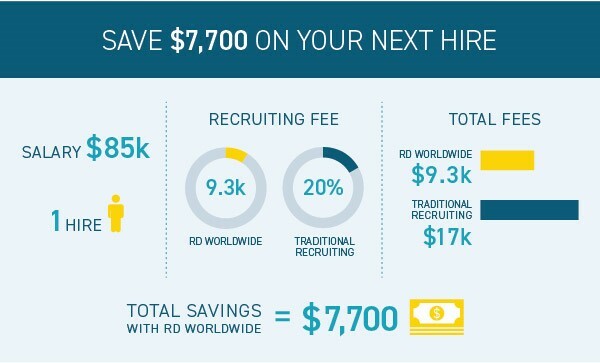 In fact, at RD Worldwide, we think recruiting fees are just too high. That’s why we’ve chosen to disrupt the industry with our affordable flat fee. So, what does that mean? Our flat recruiting fee means that it doesn’t matter if you’re hiring for an entry-level or C-level position. Regardless of salary or position, you can always expect our high-quality service for one flat fee of $9,300! We’ve seen firsthand how offering a fair flat fee has afforded the opportunity to businesses, especially small and medium-sized businesses, to use recruiting experts for the first time. It’s our promise: less fees, more talent. You don’t want just anyone working for you. You want the cream of the crop. The rising star. The dedicated career partner. That’s why at RD Worldwide, we select nothing less than the best across all industries. Need talent for manufacturing? Check. Need a marketing guru? Check. Need someone with professional expertise in the engineering or technical sphere? Check, check, check. We can help you find talent in virtually any industry, and we’re highly specialized in sourcing talent for the manufacturing, engineering, automation & controls, transportation and technical industries. We utilize our top-of-the-line resources and go beyond the resume to focus on total fit. Our numbers can definitely attest to this. Over 90% of the talent we’ve placed 4 years ago are still with their paired client. How does that sound for success? We work fast—because who likes waiting? Our average recruiting cycle is just less than 45 days. 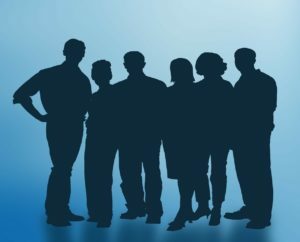 At RD Worldwide, we leverage our network along with other sources, sophisticated profiling techniques and innovative tools to locate quality candidates. 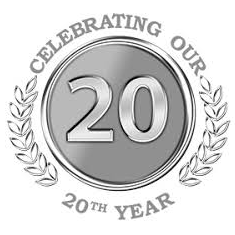 In fact, our model has been proven and tested over the last 12 years, allowing us to enable you with stellar candidates that meet all your specific criteria. Searching for passive candidates is a big part of what we do. We build relationships with talent who aren’t necessarily active in the job market, but can be motivated to moving on to bigger and better things when presented the right opportunity. That’s just part of how we provide great results: through strategic partnerships and knowledge sharing. With our expansive talent network of candidates, our great people are empowering businesses to achieve phenomenal results. Are You Ready to Make Your Team the Best It Can Be? RD Worldwide provides in-depth expertise across many industries to effectively address your unique challenges. From our world-class resources to our great attention to detail, a quick email our way could turn into one of the best hiring decisions your company has yet to make.